At peninsula, we also offer “immediate dentures”. From the term, you will have a clear idea how it works. Immediate dentures refer to dentures that are placed right after the extraction of teeth. This kind of denture works by replacing all the teeth that have been extracted. There are clients with very poor prognosis and the only solution is to extract all the remaining natural teeth. This happens in case of serious gum problems. In such circumstances, our dental laboratory is always ready to make complete dentures for you. Complete –This type involves the top and bottom portion of the teeth and used as a long lasting solution. 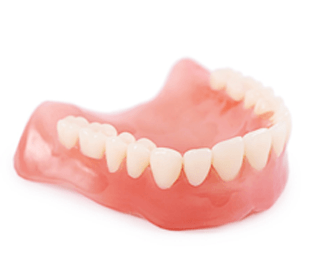 We offer a wide range of prices for our complete dentures from the economy, which is the most affordable to custom type, which is a bit expensive and the deluxe type that offers the highest level of strength, resistance to stain and aesthetic appeal. Partial – We offer a transitory solution to let the gums heal first prior to another surgery or treatment. The most popular that we have includes the cast metal type, which is the strongest along with the acrylic and flexible version. How Will You Benefit From Immediate Dentures? Zero Gap – There is no need to smile with no teeth or with a gap. Reduced bone resorption – Immediate dentures help reduce resorption as the ridges are loaded right away. Healing – By having an immediate denture in place, the clot that forms underneath the gums get stabilized. Enhanced speech and chewing – It lets you chew normally and prevent your speech from being negatively affected. Great alternative – With immediate dentures, the natural teeth position will be copied and the right denture height will be measured. In our laboratory, we are very meticulous with the process because we want to make sure that we are doing it right for our clients. Right after taking the teeth impression and the bite, the identified tooth/teeth will be extracted. Then, our technician grinds the teeth off to the model to copy the tooth extraction and create the denture in the normal fashion. Our dentist then confirms that the right tooth was added prior to the extraction of tooth. After, we set another appointment to review the fit and ensure that the necessary adjustments were made before the actual installation of the denture. Our professional team then performs follow up and gives care instructions to prevent the possible complication and issues related to immediate dentures. We also monitor and perform the required adjustments until a complete denture is ready to take over the place of immediate denture. Looking for a dental clinic on the Mornington Peninsula that can determine whether Immediate Dentures are suitable for your teeth? Contact us today on (03) 5981 2255 or book online peninsuladentalcare.com.au for a consult so that we can assess your suitability.